The FBI is investigating the stunning heist, which has raised concerns about the security of commercial aircraft and mental health issues among airline workers nearly 17 years after the Sept. 11, 2001, attacks. Richard Russell was a ground services worker for Horizon Air. The hardest part of stealing a commercial plane from an international airport was already over for Richard Russell. 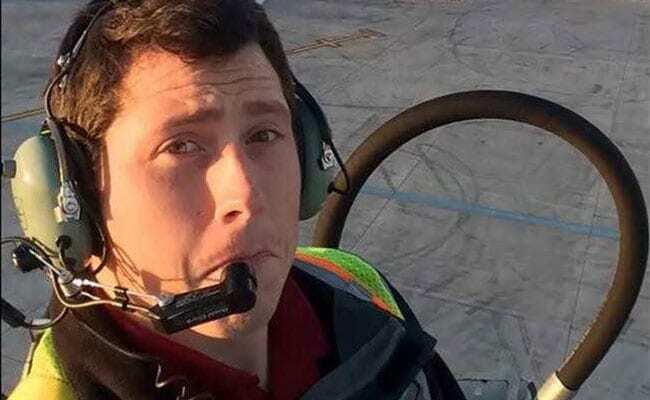 Russell, a ground services worker for Horizon Air, was permitted to get very close to passenger aircraft. And part of his job was to drive the tractor that backed the aircraft into position for takeoff. He spun a plane around Friday evening without raising suspicion and climbed aboard with 76 empty seats behind him. He would have flipped overhead switches and set the propellers of the Bombardier Q400 spinning before he roared away from Seattle-Tacoma International Airport. Russell flew wild loops over Puget Sound, screamed low over frightened onlookers and had existential - and, at turns, bizarre - chats with air traffic controllers as two Air Force F-15 jets gave chase. Then, about an hour after he took off, Russell plunged into sparsely populated Ketron Island 25 miles southwest of the airport, sparking an intense fire. He is presumed dead in the crash, but no one else is thought to be injured or killed, and the fighter jets did not fire on him, authorities said. The FBI is investigating the stunning heist, which has raised concerns about the security of commercial aircraft and mental health issues among airline workers nearly 17 years after the Sept. 11, 2001, attacks. It has also suggested that Russell was more complicated than the easygoing persona of his known online footprint. Now a family is left to reckon with tragedy, while strangers find grim inspiration in his final act. Public acts of violence - like mass shootings - often reflect the perpetrator's troubled, dark past. The Russell family released a statement Saturday evening, saying they were "stunned and heartbroken" over the incident and the loss of a man they called Beebo. Speculation has swirled over Russell's intent. He could have envisioned an aerial joyride and return to the ground. Or he could have had grim plans to take his own life. Russell told air traffic controllers that he was a "broken guy" with a "few screws loose," but also that he wanted to avoid injuring innocent people. His family's brief statement did not address any potential mental health issues. Authorities described him as "suicidal." How did he learn to fly like that? Authorities said they did not believe he had a pilot's license. Gary Beck, the chief executive of Horizon Air, told reporters Saturday that the acrobatics and maneuvers, including barrel rolls and one loop that brought Russell feet from the water's surface, were "incredible." His conversation with controllers reveals limited experience. At one point, he explains he doesn't know how to follow instructions to "punch in" data or how to assess his fuel consumption after takeoff. In another moment, Russell says he is lightheaded and talks about adjusting the cabin pressure, but it is not clear whether he was able to do that. "To be honest with you, commercial aircraft are complex machines. They're not as easy to fly as, say, a Cessna 150," Beck said. "I don't know how he achieved the experience that he did." "He did a barrel roll in a stolen plane and went out in a blaze of glory. Will many of us have a better story to tell when we get to wherever we're going," one Reddit user says in a thread. Another called it "cathartic and liberating." Social media accounts of Russell have become funeral guestbooks, digitized for the world. Mourners gathered in the comments section of his YouTube video. "RIP Rich. You went out the way most of us dream," one user wrote. "The candle that burns twice as bright burns half as long," another said.